This year I baked a vegan cake. I am not a vegan, but this new type of baking is just as delicious as conventional baking. And with the Queen of Vegan Baking, Gretchen, what can go wrong? Well, something did go wrong, but more about that later on during the week. It’s time to take this cake off the photo table and drive to my family and eat this baby! Finally I have some time to write up a few things about this cake. Gretchen’s recipe (linked below) is super easy to follow and do check out the accompanying video on her YouTube channel as well if anything is unclear. One thing I did notice in the cake recipe is that “3 tablespoons” are not 90 ml but 45 ml (1 tablespoon = 15 ml). The reason why I needed to bake a further cake is because the first two cakes didn’t bake high enough to be cut in half again. Gretchen’s recipe uses molasses. Molasses is a thick dark-brown juice which is a byproduct from making sugar from sugarcane or sugar beet. As I didn’t find any in the shops before Christmas and didn’t want to order it online especially I used a popular German breakfast spread which is a sugar beet syrup. It’s dark, thick and like treacle but it is different than molasses as it is made by boiling down sugar beet. And when I looked at the video again it seems that it is slightly thicker than molasses. So the cake was obviously heavier, also baked longer than the stated 25-30 minutes and it is was very moist. Super tasty, but I wanted to make a high cake. So I baked this chocolate cake from Gretchen as well (in two 20 cm round baking tins). I added the same spices as in the ginger cake recipe. Perfekt. This is how the cake looked like inside. I filled and decorated the cake with whipped white chocolate ganache: 800 g white chocolate and 400 ml soya cream (Alpro). Being on holiday I had time to actually try tempering chocolate properly to avoid floppy and sagging Christmas trees. 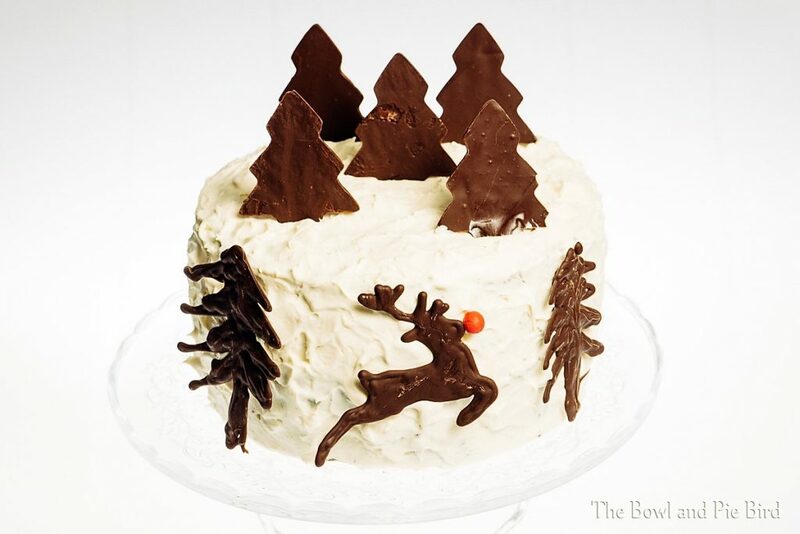 I piped the Christmas trees on the side of the cake free-hand just like you draw those quick squiggly trees. Rudolph I traced from an outline I printed off the internet, his nose is a small ball of red fondant. The trees on the top of the cake I made with a cookie cutter by spreading out the tempered chocolate thinly onto a piece of baking paper, letting it set for a bit and then carefully pressing the cookie cutter on the chocolate. 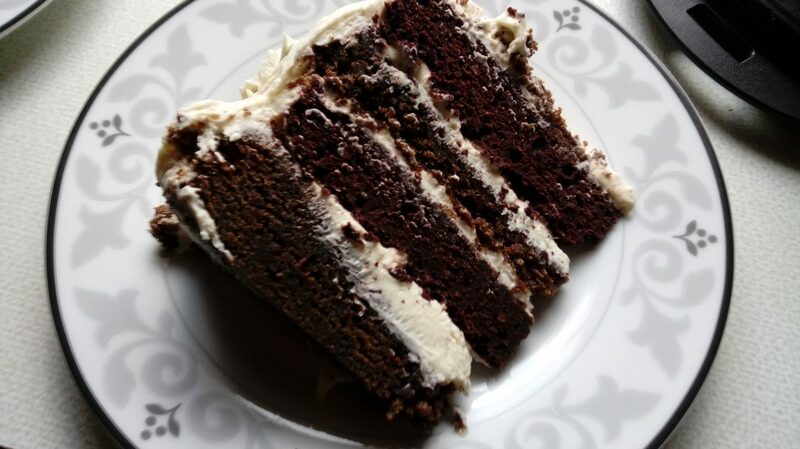 This entry was posted in Cakes and tagged chocolate cake, Ganache, ginger, Ingwer, schokoladenkuchen, Vegan.